Minimally invasive hand and wrist surgery refers to treatment of bone and soft tissue injuries without the need for traditional open incisions. Instead, with the aid of various tools and techniques, the orthopaedic hand surgeon is able to visualize and repair the affected area through one or more small incisions or portals in the skin. Benefits of this approach include reduced risk of injury to surrounding healthy soft tissues, a speedier recovery, and minimized scarring. Minimally invasive hand and wrist surgeries may be divided into two categories, those that employ arthroscopy to directly visualize internal structures and those that use indirect techniques of visualization and percutaneous surgery. In arthroscopic surgery, the orthopaedic surgeon inserts an instrument equipped with a miniaturized video camera into a joint space to obtain a magnified, high-resolution image of the joint. This image is projected onto a monitor in the operating suite. The surgeon can directly visualize and treat the affected tissues using additional instruments that are inserted through accessory portals. During percutaneous procedures, the hand surgeon performs surgery by inserting instruments or fracture fixation devices directly through the skin, and most often monitors the accurate placement of these devices with the use of x-rays or fluoroscopy. Fractures of the distal radius (commonly known as wrist fractures) are the most common fractures of the upper extremity. These fractures frequently result from a high-impact incident, such as a sports injury or a fall from a height, and are often broken into a number of fragments. In addition, the joint surface of the wrist is frequently disrupted, creating the potential for the long-term development of pain, stiffness and arthritis. Scott W. Wolfe, MD, who is now Clinical Director of Orthopaedic Surgery at the Hospital for Special Surgery (HSS), pioneered an arthroscopic technique for treatment of distal radius fractures with colleagues while at Yale University. "This surgery actually combines arthroscopy with percutaneous fixation, to yield strong fixation with minimal additional trauma to the injured soft tissues around the fracture," he explains. Treatment begins with external fixation of the bone, using threaded pins and a frame. The orthopaedic surgeon then uses the arthroscope and small instruments to realign the joint fragments and removes any small fragments of bone that may have broken loose. Bone grafts (or more recently, bone graft substitutes) may be used to fill any structural defects resulting from the break. 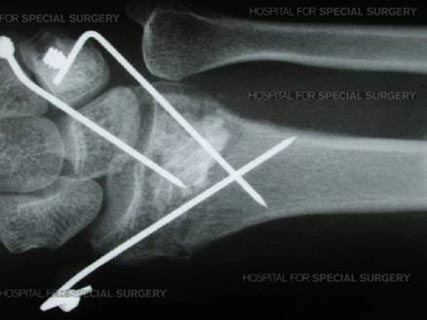 Using a percutaneous technique, pins, wires or screws are inserted to hold the bone fragments in place during healing-a period of approximately six weeks. Dr. Wolfe and his colleagues evaluated seven patients who were treated with this technique at a period ranging from between 12 and 45 months following surgery (average follow-up was 27 months). Their published findings showed that all seven patients were free of pain and had returned to work. On average these individuals recovered 92% of their range of motion and 98% of their maximal grip strength in the affected wrist, when compared with the uninjured wrist. Complications were minimal. Dr. Wolfe is currently the Principle Investigator on an FDA-approved clinical trial that is investigating the use of a new biologic compound to further accelerate the healing of these percutaneously-treated fractures. Ulnar-shortening "wafer" osteotomy, in which the surgeon removes a small portion of bone from the ulna. This surgery is done to correct injury to the distal radioulnar joint, the area where the radius and ulna meet. Removal of bony arthritic spurs. In some cases, the surgeon can remove the radial styloid (a bony prominence on the wrist near the base of the thumb) to provide relief. Inflammation or debris from wear and tear within the wrist joint as well as any fragments of bone or soft tissue may be removed at the same time. Scaphoid fractures can be realigned with the assistance of the arthroscope. The scaphoid is a small wrist bone that is particularly vulnerable to fracture in young, active patients, a fracture that traditionally has required many months of plaster cast immobilization. The arthroscopic technique is combined with percutaneous surgery to realign displaced fracture fragments and fix the fracture with a small screw placed entirely inside the bone. This treatment allows patients to begin early active motion of the wrist and avoid the downtime and loss of work that accompanies plaster cast treatment. 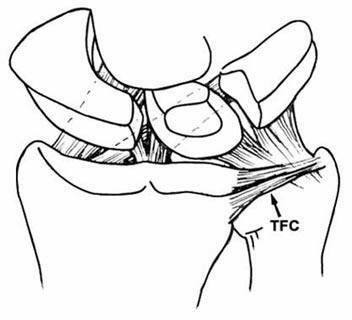 Repair of the triangular fibrocartilage, an important structure that links the radius and ulna. Tears may require debridement-a cleaning up of loose tissue fragments-or the use of sutures. Removal of fluid-filled cysts on the back of the hand known as ganglions. While ganglions are very common and are benign, they can be painful and disfiguring. Also performed as an open surgery, arthroscopic ganglion removal appears to shorten recovery time and yield results that are comparable to traditional open surgery. . Thermal shrinkage for lax structures such as ligaments or joint capsule. A new area of arthroscopic surgery that is not yet in wide use, this technique involves the use of small probes that transmit electrically-induced heat to the tissues where they shrink the collagen. Specific uses for this technology are still being defined. New methods of fixation for scaphoid fractures represent the most dramatic revolution in the treatment of wrist injuries in the last three decades. Fractures of the scaphoid (also called the carpal navicular) usually occur in sporting accidents or during a fall on the outstretched hand. The scaphoid has a peculiar blood supply that renders it vulnerable to delayed healing or even failure to unite. Delayed or incomplete treatment can lead to severe wrist arthritis. While cast treatment is a time-honored treatment method that enjoys a high rate of success, the three to four month casting period that is necessary for healing can be quite disruptive to occupational and daily activities. Surgical treatment with percutaneous surgery enables rapid healing without the confinement of a cast. 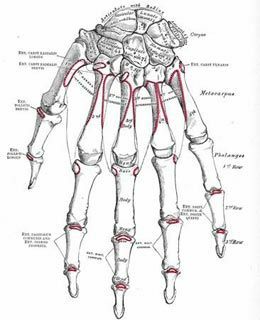 Illustration of bones of the left wrist and hand. "Historically, a number of these fractures were missed and there was a high-rate of failure of the bones to heal properly," says Dr. Wolfe. "Now, diagnosis of scaphoid fractures has been improved with the use of advanced imaging methods and treatment of these fractures can be performed with arthroscopy, fluoroscopy, or both." Images obtained with fluoroscopy can then be used to guide the insertion of screws (through a 1 to 2 mm incision) into the bone to stabilize it. 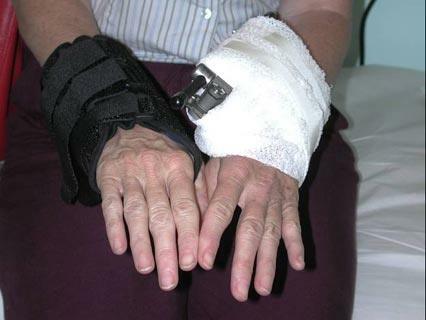 Once the fixation is complete, the patient is generally able to recover while wearing only a removable splint, and is able to begin range of motion exercises almost immediately after surgery. Surgery is completed in less than an hour. In the past, an open procedure was required and the patient then wore a cast for up to 2 or 3 months postoperatively. Healing rates for percutaneous scaphoid fracture fixation are as high as 100%. Several fractures may now be treated using percutaneous fixation techniques, including those of the phalanges and metacarpals. 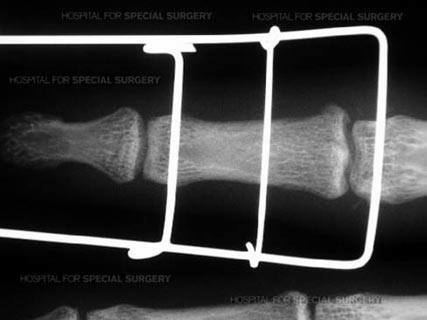 For severe fractures involving the finger joints, the patient's finger is sometimes placed in an external fixator apparatus, and the surgeon employs fluoroscopy to guide the placement of wires and screws for bone stabilization. This treatment allows the patient to begin gentle motion within a few days of surgery. Early rehabilitation of these complex injuries has been shown to decrease the occurrence of post-operative joint stiffness when compared with traditional open techniques. Percutaneous procedures for soft tissue injuries include treatment for trigger finger, a condition in which a tendon becomes entrapped within a tight sheath in the palm, and painfully snaps during routine use of the hand. Release is provided by dividing the stenotic sheath. 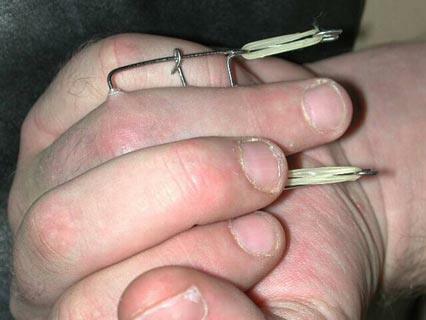 In traditional surgery, this required an open incision in the palm of the hand. Percutaneous technique allows the surgeon to accomplish the same surgical result without an incision, using a special needle. Treatment for carpal tunnel syndrome, while not strictly defined as a percutaneous procedure, is somewhat similar. In this condition, the patient experiences pain and numbness in the hand as a result of compression of the median nerve in the carpal tunnel of the wrist. 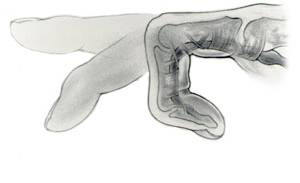 To alleviate this pressure, some hand surgeons utilize an endoscopic technique rather than the traditional open surgery. 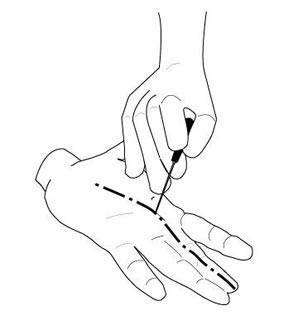 Small instruments are inserted beneath the skin to identify and release the transverse carpal ligament. The procedure creates more room in the carpal tunnel and relieves nerve compression. These mini-incision techniques have been shown to provide comparable long-term results to traditional, open surgery and provide a quicker return to activities in the short-term. It also provides a good option for patients who cannot tolerate a large incision in the palm of the hand, such as those who rely on a cane or crutches for ambulation. Minimally invasive surgery has been shown to be safe and effective for a number of hand and wrist conditions. However, no surgery is without risk. The surgeries, not unlike their open counterparts, still involve the possibility of nerve or blood vessel injury. According to Dr. Wolfe, the best way to ensure a successful outcome and minimize that risk is to seek care from an orthopaedic surgeon with specialized training and experience in surgery of the hand. "These procedures are not replacing traditional surgery," he adds. "While they may ultimately prove to result in better and faster recovery, they are not appropriate for everyone. Electing to have minimally-invasive hand or wrist surgery is a patient and surgeon-guided decision." With the growing interest in, and successful outcomes of minimally invasive surgery, Dr. Wolfe anticipates that more procedures will become available in the future, including-with the development of smaller instrumentation-use of arthroscopy in smaller, tighter joints.